My research is driven by the impacts of historic climate change; I strive to better understand recent observations within a geologic context. My primary field area is in marine basins of Antarctica, where I reconstruct the behavior of tidewater glaciers from sediment cores, diatom microfossils, and geophysical data. Analyzing regional differences in glacial behavior will help elucidate controls on their stability, including internal glacial dynamics, drainage basin size, orography, oceanographic conditions, and climate. Understanding these controls can help us better predict glacial responses to ongoing climate and oceanographic changes. I am also interested in flooding history and storm impacts in the Gulf of Mexico region, and specifically how climate and land use changes affect coastal environments. Sedimentology, algal bloom records, and geochemical signatures of sediment cores collected from bays that drain major metropolitan areas are used to identify and compare post-industrial vs. natural Holocene flooding history. Following my experience in industry, I am fascinated by paleoenvironments of the ancient Gulf of Mexico, namely the Jurassic aeolian Norphlet Fm. 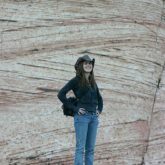 I am currently pursuing research on core and log datasets from the Alabama region with the Center for Sedimentary Basin Studies. The aim is to integrate core lithofacies with petrofacies to better predict paleoenvironments and reservoir quality at the regional scale. I am searching for motivated students of sedimentology and micropaleontology to investigate some of our most pressing questions about environmental impacts of past and present climate change. Contact me if this is you! Minzoni, R.T., Anderson, J.B., Wellner, J.S., Fernandez, R., under consideration, Increasing glacier sensitivity to climate change in the Antarctic Peninsula. Bregy, J., Wallace, D.J., Minzoni, R.T., Cruz, V.J., accepted to Marine Geology, 2500-year paleotempestological record of intense storms for the Northern Gulf of Mexico, United States.